Unlike most other first world nations, the United States does not have a federal law requiring employers to provide paid family or sick leave. In the U.S. these requirements are only mandated on the state and local levels. The federal Family and Medical Leave Act (FMLA) does require eligible employers to provide unpaid family leave, but paid family leave and paid sick day ordinances are left to the states. For example, California has had the Paid Sick Leave Law, or the Healthy Workplace, Healthy Family Act of 2014, since July 1, 2015. However, there are least six additional municipalities within the state of California that have passed their own, additional, paid sick leave ordinances. For many employers, both large and small, it is a challenge comply with and to implement all the required processes, forms and notice postings for both the state and their city or county in these locales. In addition, all of the local ordinances exceed the state requirements and have different stipulations imposed on employers. You can find more information on the FAQ page of the State of California's Department of Industrial Relations website. In addition, employers can find information about the individualized Notice to Employee here. In addition to providing paid time off for illness, many of these laws also allows workers to use their paid sick days for other reasons such as caring for other sick family members. For example, Emeryville provides for paid time to care for guide and service dogs. The state of California allows employees to use this time in cases of sexual assault, harassment, or domestic violence, as well. A number of cities and some counties in California instituted their own, additional, paid sick ordinances subsequent to the passing of the state's Healthy Workplace, Healthy Family Act of 2014. As statewide paid sick leave law does not supersede local ordinances, employers must comply with both the state and their local laws, whichever most favors employees. San Francisco - June 7, 2018. The city’s paid sick leave rules impose local employment standards that exceed state requirements. Oakland - March 2, 2015. The Oakland law is significant because it imposes greater restrictions on employers than does the statewide law. Berkeley - October 1, 2017. This ordinance provides exceptionally generous paid sick leave benefits to employees beyond those provided by the California law. Emeryville - June 2, 2015. Paid sick leave and minimum wage ordinance that includes paid sick time to care for guide dogs, signal dogs and service dogs. Los Angeles - July 1, 2016. Many employees within the City of Los Angeles will be entitled to accrue 48 hours of paid sick leave per year. San Diego - June 7, 2016. Paid sick leave and minimum wage ordinance that supplements California sick pay law with additional paid sick leave entitlements. Having a written policy in place can help ensure compliance on the part of employers and provide a ready reference for employees. Implement a written sick leave policy that fully explains what kinds of situations are appropriate for calling in sick. Of course, not every instance of sick leave questions can be addressed so keep the policy flexible but be firm and fair in the administration of policies. With the plethora of stipulations both state-wide and, in many cases, locally, abuse of sick time is possible. A written policy should establish how much time the employer provides for sick leave, procedures for calling in sick, and clearly stated consequences for chronic sickness. If your employees can be written up for misusing sick time, passed over for promotion, or terminated from employment, all these instance should all be explained in your policy. 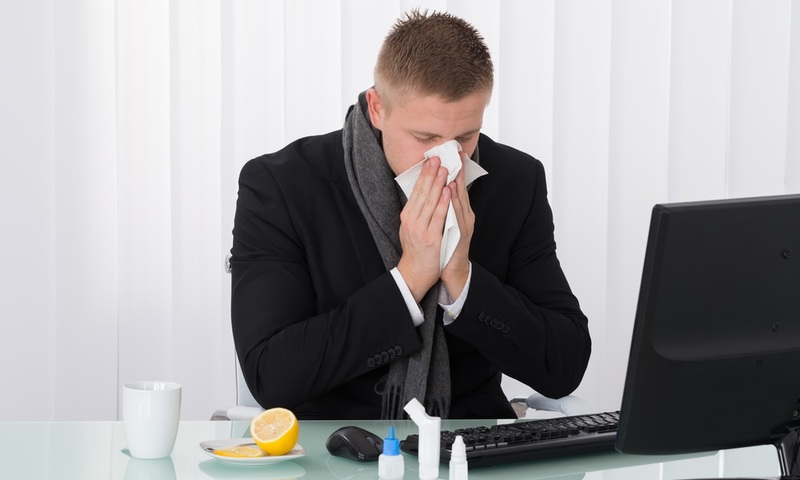 Maintaining an updated and compliant paid sick leave strategy and policy will help your organization meet its obligations, as well as provide accuracy and timeliness. Understanding the law, automating sick leave tracking and calculations, and prioritizing accurate record keeping will make compliance a sure thing. Accuchex is a full spectrum Payroll Management Services provider offering expertise in Time Management, Insurance and Retirement issues, as well. If you are looking for reliable resource for your HR issues, we can help. 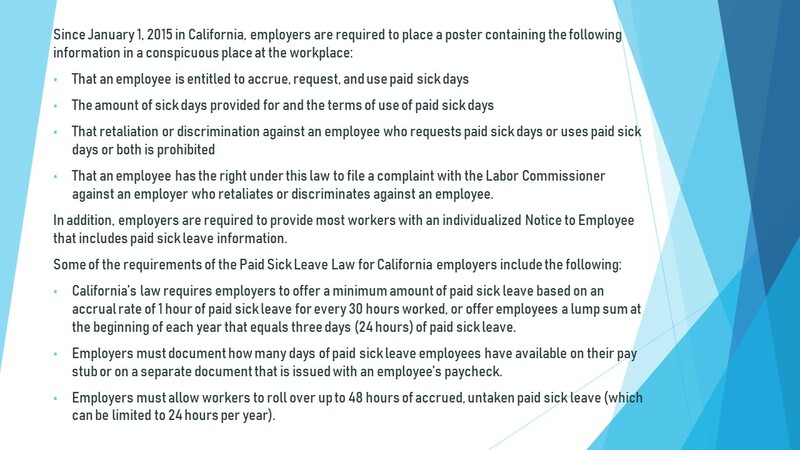 And you can get your Free Download: California Paid Sick Leave Law to help you make an informed decision, or call Accuchex Payroll Management Services at 877-422-2824.